More info:Child (under 16) US $3,050. Local payment US $300. Bike hire US $300. Price includes accommodation, transport and most meals. Minimum child age 10 years. We will take families with children younger than 10 after consulting with the guardians. This family cycling holiday in Kenya and Tanzania is an exciting and original way to introduce your children to Africa. On a 16 day adventure, you will pedal along quiet routes, far from the main tourist circuit, through a dazzling range of scenery, from open savannah and desert, to mountain rainforest and tropical Indian Ocean coastline. Cycle to small villages, meet local tribespeople and spot wildlife grazing on the plains. You will have time out of the saddle, too, hiking in the foothills of Mount Kilimanjaro, camping in the wilderness with a local Maasai family and enjoying safari game drives. This holiday begins in Nairobi in Kenya and finishes in Dar es Salaam in Tanzania. You will be travelling in a small group of between four and 12 bikers (one to three families) from all over the world, guided and fully supported by our team of three trip leaders. All your luggage, plus lunches, snacks and water are transported in the support vehicle, and you can grab a ride in it whenever you fancy a break from cycling. Accommodation includes four nights in local guesthouses and 11 nights camping in spacious dome tents. We take care of your meals and snacks throughout your trip, with the exception of two lunches and three evening meals which are at your own expense. This is a great chance to pick where you’d like to eat and try the local food. You can’t come to East Africa and miss out on the wildlife this region is so famous for, so this holiday includes game drives in Saadani National Park and the Ngorongoro Crater in Tanzania and Amboseli National Park in Kenya. You will also visit a local school in the unspoilt Usambara Mountains. What is the cycling like? We have created this family adventure to include everything that’s special in our regular biking adventures, but with reduced biking distances and extra family friendly activities added in. We cycle 10km-40km per day; a total distance of 230km-300km spread over 11 days of biking. This can be extended for those wanting more of a challenge. The terrain is flat or gently undulating, and the cycling surface is made up of 80% dirt roads, 15% paved and about 5% non technical single track. You may be cycling over rough, gritty or potholed surfaces, so having some off road biking experience is an advantage, but not essential. Wonderful guides, incredible access to the remotest regions and real people. Do it! Bring something thoughtful to share with the school in Tanzania. It is such a special experience. Wonderful - genuinely the holiday of a lifetime and a never to be forgotten special experience. Every day brought new experiences. The animals just kept coming out on cue! Just go for it. You don’t need to be a mega cyclist to enjoy the family holiday. All food was bought locally and purchases were spread amongst the stallholders at markets. All campsites were left clean. Brilliant - I don’t know how we will top it. Waking to the sound of a lion killing a wildebeast behind our tent in Amboseli National Park campsite. Singing and dancing with 500 children from a local primary school in Tanzania. Relax and enjoy new experiences. Yes - great to have so much local food and leave campsites as we found them. Many memorable days, but the highlight has to be the day we woke early to drive into Amboseli National Park, where we came across lions & hyenas on a fresh kill. We were the only vehicle there for 45 minutes. Later that day we cycled across Amboseli lake bed to Solomon's Rock campsite where we had dinner on the hill top watching the sun set. Be aware that there is a significant local payment, which, if you are using the operator's bikes, amounts to $500 per person. 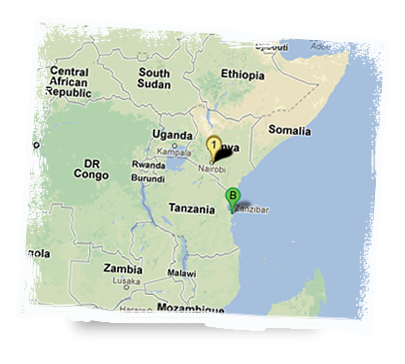 A wonderful opportunity to get off the beaten track and see parts of Kenya & Tanzania where mainstream tours don't go.